CRAFT brewer Franciscan Well, which includes Ireland’s number one* craft beerRebel Red in its range, is bringing its award winning craft beers into canned format in Northern Ireland from September. Rebel Red, Friar Weisse and Chieftain IPAwill be available in a 330ml can for the first time in off licences across Northern Ireland, with selected bars also stocking the product. 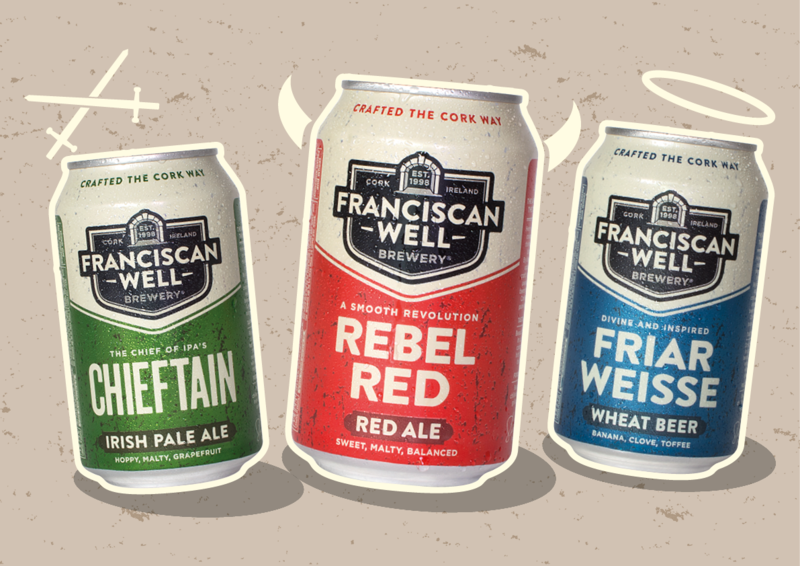 It is the first time Franciscan Well, which is brewed in Cork, has canned any of its beers and also the first time that Friar Weisse or Chieftain IPA will be available for purchase in off licenses. The decision to can Ireland’s favourite craft beer range is part of an international trend which has seen rising consumer demand for craft beer in a can instead of a bottle. In the USA, 30 per cent of all craft beer sold in the off-trade is in can format. In Ireland craft beer sold in cans accounts for around 15 per cent of sales in the off-trade and that figure is expected to double over the next couple of years. All brewing and canning will take place at Franciscan Well’s new brewery in Cork city. The brewery opened last year, reinforcing Franciscan Well’s Irish and Cork heritage. The North Mall site will be used as an innovation centre. This decision from the award winning Cork Brewery is in keeping with internationally recognized best practice for freshness and taste, with cans providing superior product packaging quality and infinite recyclability. Consumers are increasingly choosing to buy craft beer in cans for a number of reasons. Cans are more lightweight and portable than bottles, meaning they are easier for consumers to enjoy in more places and for bars and off licences to display. They are also infinitely recyclable, chill more quickly and are better at protecting the taste of the beer. “We are very excited about this latest innovation for Franciscan Well, coming as it does less than a year after the opening of our new brewery in Cork,” said Shane Long. As well as being offered in a can, the Franciscan Well range will also feature a new logo. Shane continued: “The new logo more clearly reflects the provenance of the brand and its roots in Cork. The new identity and logo retains the strength of the previous mark, while emphasizing that this is very firmly an Irish beer which was established in Cork and which is still brewed there. We believe that the provenance of Franciscan Well and its roots in Ireland are extremely important and it is something we are very proud of. “The new brand mark positions Franciscan Well as an authentic Craft brewery from Cork, Ireland. The archway is a new devise that has been created to highlight a strong sense of place, that is welcoming and which captures the unrivalled heritage associated with the brewery founding site along with the welcoming aspect of our range of beers,” concluded Shane.